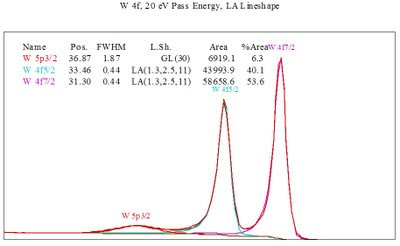 Binding energy values for the W 4f7/2 peak-shape are based on a survey of literature values (NIST database) and on standard reference materials (WO3 and W metal) analyzed using similar spectrometer conditions. The metal peak is found at ~31.3 eV  and has an asymmetric peak-shape with a FWHM (full-width at half maximum) of 0.38 to 0.46 eV depending on the lineshape and pass energy used. When fitting the metal component of a W 4f spectrum containing the metal and additional oxide species an additional component corresponding to the W 5p3/2 peak must be factored in (but remember to set its RSF to 0). The W 5p3/2 peak is set at 5.5 eV above the W 4f7/2 peak. Peak area ratios and FWHM's can be obtained from the CasaXPS ready file of tungsten metal. An example using the LA lineshape and a 20 eV pass energy is shown in Figure 1. Figure 1. W 4f (and W 5p3/2) XPS spectrum for tungsten metal. W 4f spectra with the metal and oxides are fit with a 4f7/2 – 4f5/2 doublet separation of 2.18 eV and with area ratios of 4:3. For the oxide peaks the W 5p3/2 component can be ignored as it is outside the main W 4f envelope (as opposed to the metal W 5p3/2 component which overlaps with the oxide components). The W(IV) and W(VI) - 4f7/2 and 4f5/2 peaks are generally all constrained to have equal FWHM. Binding energies are presented in Table 1. A CasaXPS ready example of fitting of the metal, carbide and oxide is presented here. Table 1. W 4f7/2 binding energy data for various tungsten compounds. O 1s values for WO3 and WO2 are 530.5 eV +/-0.2 eV (18 references) and 530.7 eV +/- 0.3 eV (4 references). A) The C 1s peak for WC (tungsten carbide) is at 282.7 - 283.0 eV . B) Some papers suggest that a W(V) species may be found (binding energy~ 34.4 eV) in some spectra. While molybdenum forms a stable pentoxide, tungsten does not. However there are a number of known W(V) compounds such as Nax(WO3) (where x is between o and 1). Proceed with caution when adding in peaks for any W(V) compound. 2) M.C. Biesinger, unpublished results (2009). 3) N.V. Alov, Journal of Analytical Chemisry, 60(5) 431-435 (2005). 4) A.G. Sharpe, Inorganic Chemistry, Longman Scientific & Technical (Wiley), New York, 628-634 (1986).